"Being fifth all weekend isn’t what I’m looking for but the feeling improved on Sunday and I felt more consistent in the final race. We were running the bigger brake discs, which I didn’t have the best of feelings with this weekend, but in general we made a big step with the bike. "I can say now that I have been suffering with a trapped nerve in my back, which flared up just before I came here, and I have had to take painkilling injections all weekend. I struggled a lot this weekend and I am glad it is over in some ways. 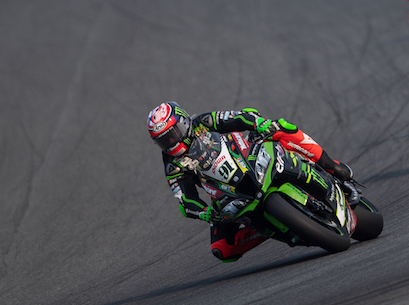 Kawasaki Racing Team's Leon Haslam finished third in the Superpole Race and then third in Race Two in the opening round of the World Superbike Championship at Phillip Island, Australia on Sunday. Kawasaki Racing Team's Leon Haslam heads into the opening round of the World Superbike Championship at Phillip Island in Australia this coming weekend after a successful teat at the circuit earlier this week. JG Speedfit Kawasaki's Leon Haslam is the 2018 British Superbike Champion after taking sixth place in Saturday's opening race of round 12 at Brands Hatch, Kent. JG Speedfit Kawasaki's Leon Haslam is chasing three more race wins and the 2018 title in Sunday's 12th and final round of the British Superbike Championship at Brands Hatch, Kent.